I think I’ve talked about this before but never at length and i feel now would be a good time to as I’m in the throws of a hypothyroid episode. The thyroid (THY-royd) gland, a small butterfly-shaped gland in the front of your neck, makes thyroid hormones. Thyroid hormones travel from the thyroid gland through the blood to all parts of the body, where they do their work. Why are thyroid hormones important? Thyroid hormones affect your metabolism rate, which means how fast or slow your brain, heart, muscles, liver, and other parts of your body work. If your body works too fast or too slowly, you won’t feel well. For example, if you don’t have enough thyroid hormone, you might feel tired and cold. Or, if you have too much thyroid hormone, you might feel nervous, jumpy, and warm. Your thyroid gland is controlled by the pituitary (pah-TOO-ah-tare-ee) gland, a pea-sized gland located at the base of your brain. The pituitary gland keeps checking the amount of thyroid hormone in your blood. Then it tells your thyroid to make more or less hormone so there’s always the right amount. 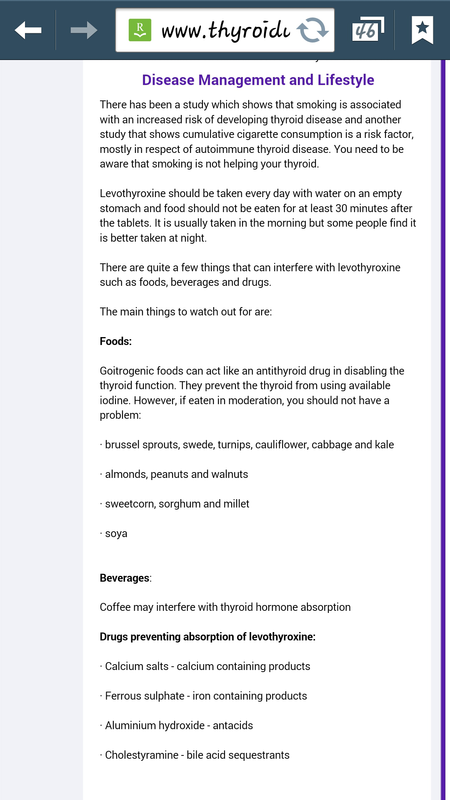 Your thyroid uses iodine to make thyroid hormone. Iodine comes from food, mainly seafood and dairy products. It is also added to salt since it can be hard to get enough from food. Your thyroid gland is located in the front of your neck. I have something called secondary hypothoidism caused by good old radiotherapy. For me the radiotherapy fried my thyroid glands and if i recall correctly the sonographer said I had been zapped and shrivelled up. External radiation is most commonly used in the treatment of head and neck cancers (NOT thyroid cancer) and lymphoma. It is an uncommon cause of hypothyroidism. The chance of developing hypothyroidism after external radiation depends on the dose given. External radiation due to nuclear accidents (such as the Chernobyl nuclear reactor incident in 1986) is also a rare cause of hypothyroidism. Secondary hypothyroidism is a much less common problem. It is caused by diseases that affect the pituitary gland’s ability to make and release TSH. 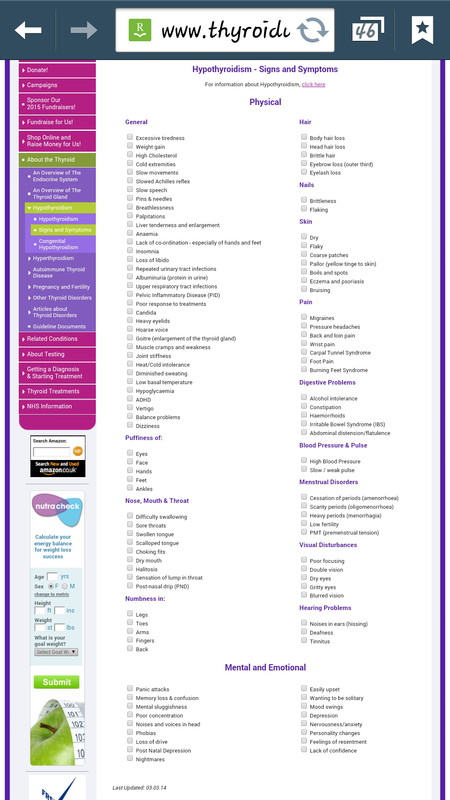 Specific problems include pituitary tumors, postpartum pituitary necrosis (Sheehan’s syndrome — an uncommon problem where all or part of the pituitary dies after childbirth), trauma, or tumors that grow into the pituitary gland. I also found this…but don’t recall where.. So from all this you can see the symptoms are many. I added the last one for information as I was suprised by how many foods interact with thyroxine and perhaps others didn’t know. 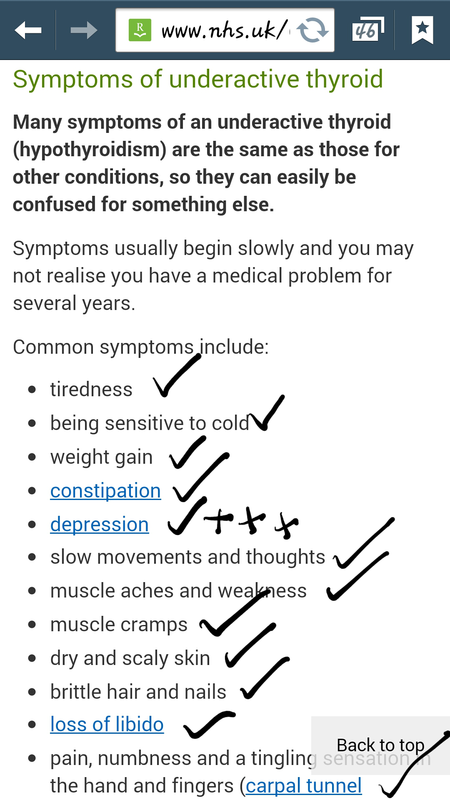 For me my symptoms include, fatigue, memory, weight gain, constipation and i suffer from severe depression and anxiety. These resulted in me being in bed for a week, last week, sleeping 20 hours a day and not functioning at all. I then had my blood taken, in dramatic style of course, due to my left arm looking like this. 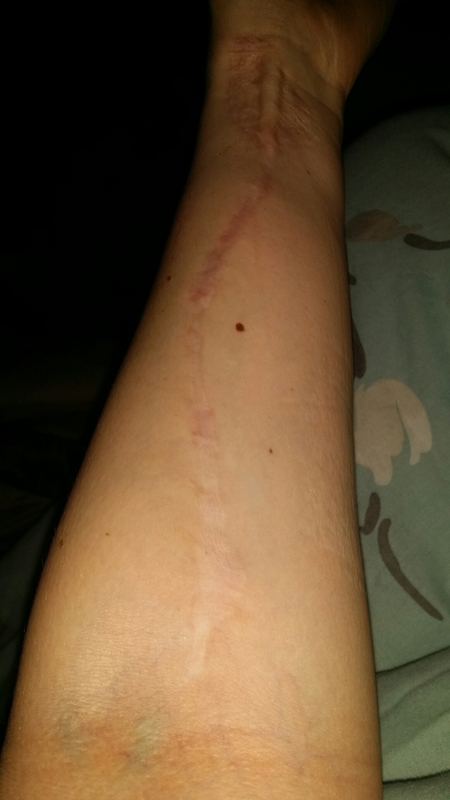 So the nurse has to use my other arm like every other nurse before her. I have terrible veins apparently they are thin deep and generally crap. Saying that there’s one vein that likes to unload after the nurse takes the needle out, i mean it spurts blood everywhere and even if i tell them it always surprises them and I end up covered in blood from my elbow to my fingers.. see i have to be dramatic. So my results came in and my results were around 70 if i recall and moral is between 1 and 3 so it’s pretty high. Saying that looking on various forums I’ve seen ppl saying theirs was over 400 I don’t know if that’s true or even possible but I’m glad mine wasn’t! ! I’m having a follow up blood test next week, I’m also seeing Mr Moss on Friday, SSAFA are taking me as hubster is teaching. I’m particularly nervous for this appointment. One reason is Emily who sadly lost her fight and passed away. This is a go fund me account set up for Emily s husband and 6 children. My husband and his work mates raised £60 + and we rounded it up to £75. If you can afford to please please donate. Right this is me signing off for now! Laugh until your belly hurts then laugh a little bit more.